My wife bought me the Freewing Rebel EDF for Christmas this past year. I have been slowly building up the courage to get her into the air and finally took the plunge today. I had two great flights despite all my nerves and shaking hands – thank god for expo! She’s definitely faster than anything else I’ve flown, but really stable and well behaved. Take-offs were uneventful, except she feels a bit sluggish until it picks up speed, and needs a bit more take-off roll than any of my prop planes. In the air, she was very predictable and responsive on low rates. I didn’t do anything fancy, but never felt like I was out of control, and at full throttle, she was tearing up the sky! 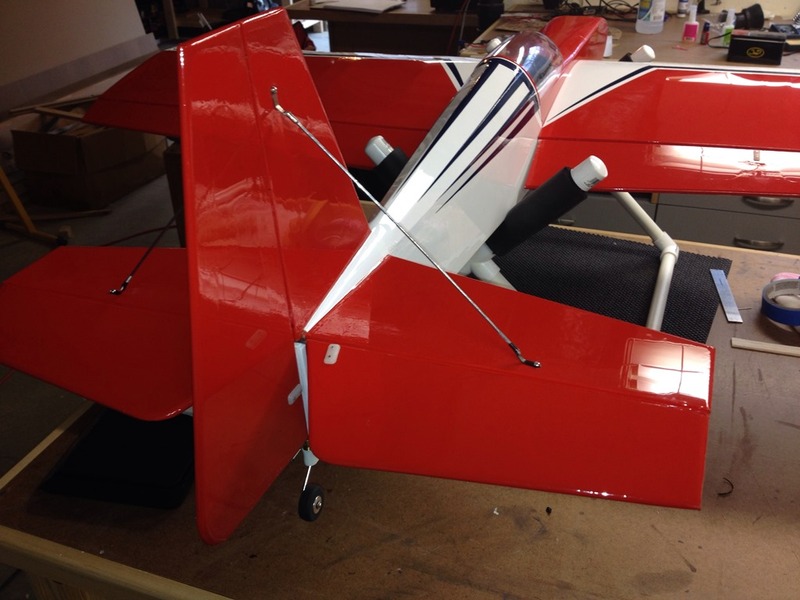 With half flaps, landings are a breeze, really no harder than my old T-28. I did not try full flaps. Flight times are a bit short, I am getting about 3-1/2 to 4 minutes with a 3000 mAh 4S battery, with ending capacity at about 20%. 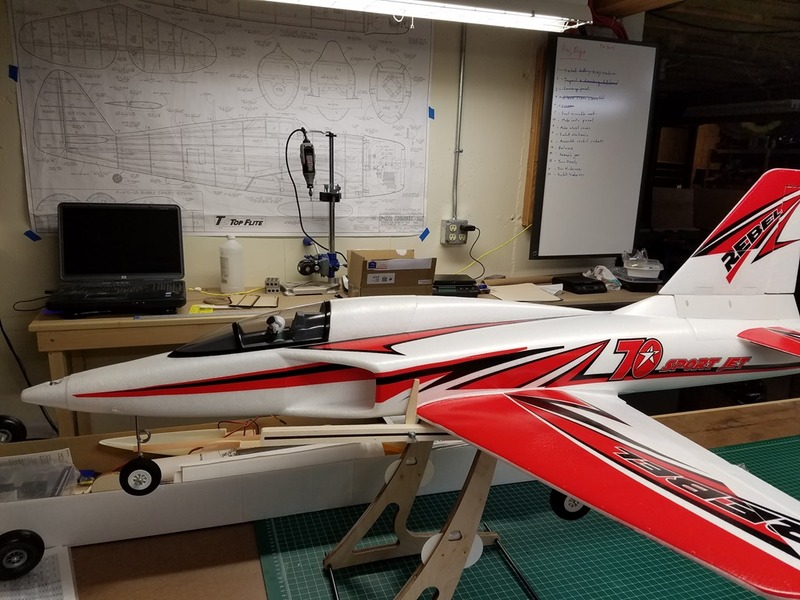 This was my first Freewing plane, and overall, I am very impressed with the quality. I did end up fussing with the elevator a bit. 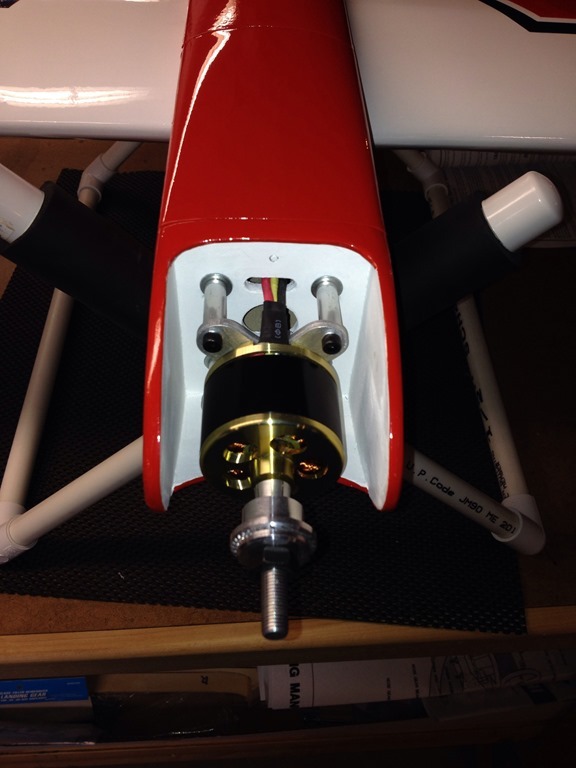 The stock setup had two pushrods, one for each elevator side inserted into a single hole in the servo arm. While I am sure that this would work fine, I was having a hard time getting both sides of the elevator to travel identically and could only het about 10mm total travel (vs the 16mm recommended). To address this, I made up a new custom pushrod set by silver soldering two wires together and replacing the clevis links with Du-BRO micro links . 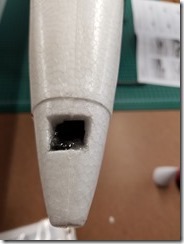 I also slightly trimmed the foam ahead of the servo to provide clearance for the pushrods. Most of the control surfaces on this plane use low friction nylon hinges, but the elevator is a standard foam hinge, and felt a bit stiff. 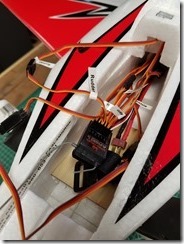 So, for peace of mind, I replaced the stock servo with Hitec metal gear servo. 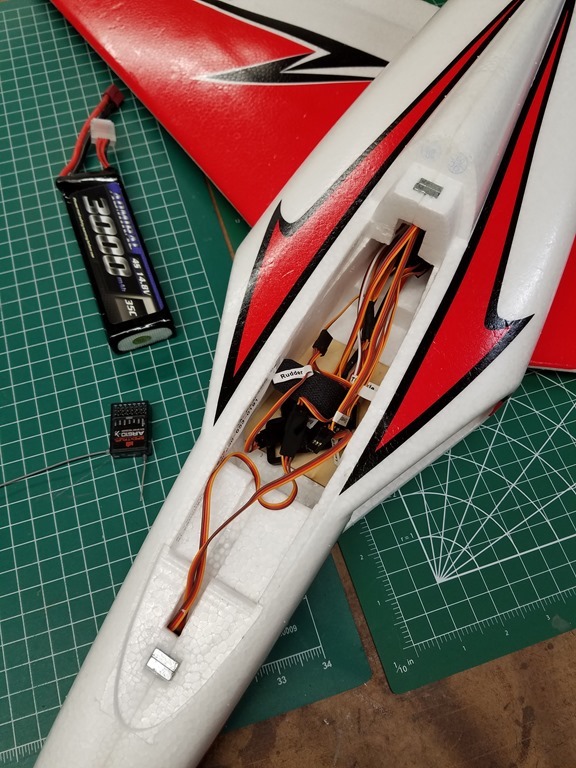 Finally, I used a slightly longer servo arm to get a bit more travel. All together, these small changes got the elevator travel up to the full 16mm, aligned, and moving smoothly. 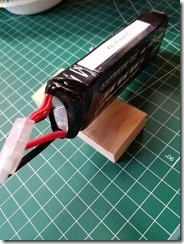 The battery compartment is a very tight fit. 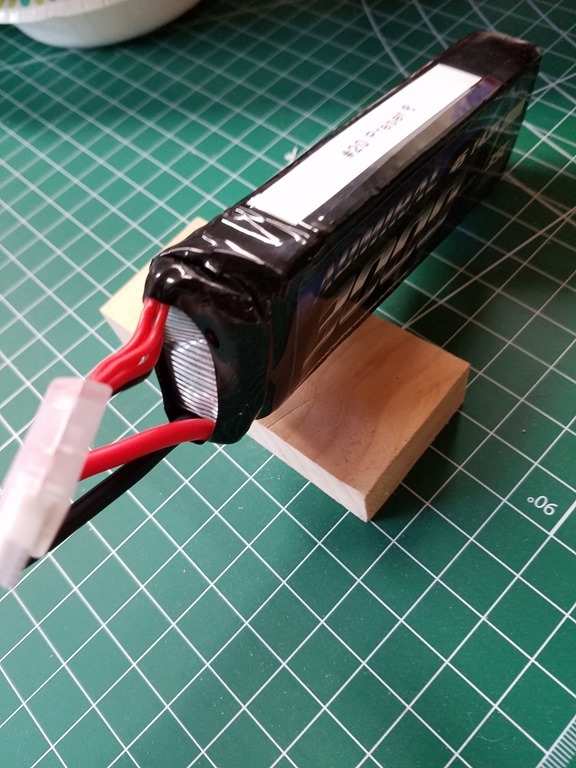 The receiver and wires fit, just barely, behind the battery cavity. 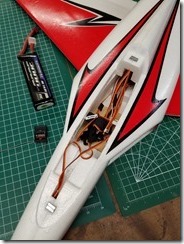 I needed to trim a small amount of foam from the front in order to fit the pack without mashing the battery wires. 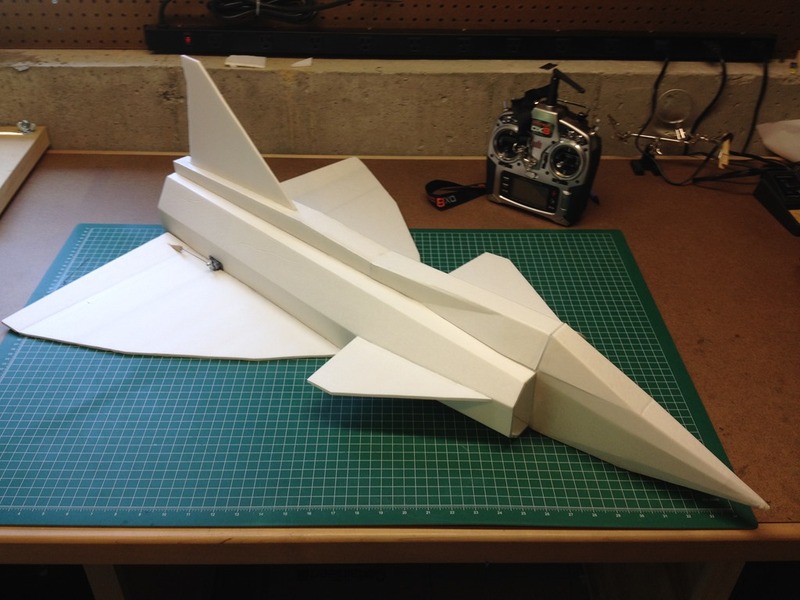 With the 3000 mAh battery, the plane needed about 1-1/2 oz of weight in the nose to balance. Before gluing on the nose cone, I cut a small hole in the nose, then mixed some lead shot into a bit of 30 minute epoxy and “pouring” it into the hole. 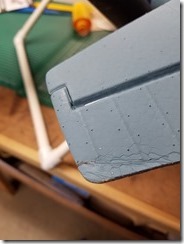 The only other fussing required was getting the aileron throws set properly. 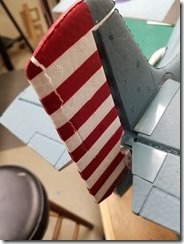 The right aileron had about 3-4mm more travel than the left. 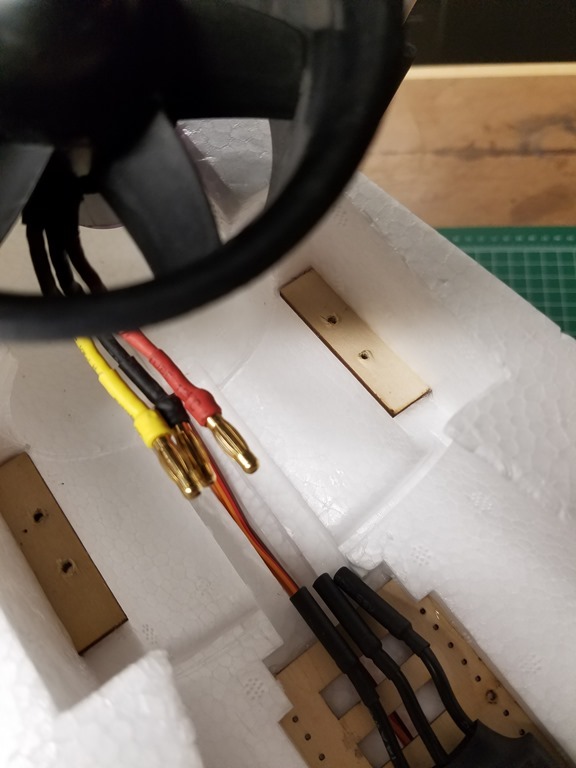 Since there are no empty spots on the 6 channel receiver, there is no choice but to join the servos on a “Y” connector. 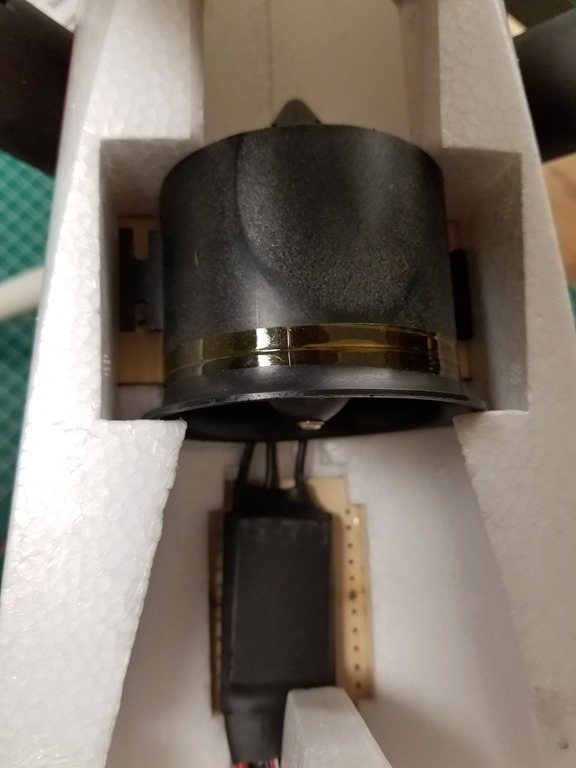 There is no way to trim one servo separately from the other. 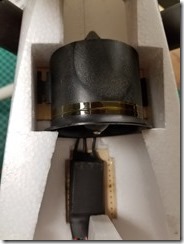 I’m not sure if the problem is with the servo, or (more likely) with the position of the control horns relative to the hinge line, but to fix the issue, I simply moved the right aileron pushrod to the outer hole on the control horn, and left the left in the middle hole. Travel is now aligned to within 1-2mm. I probably am fussing a bit more than needed, but fussing is what I do! I also got in a bunch of flights with my trusty ParkZone F4F today. This continues to be my no-fuss, no-muss plane. Like their tagline says “Just Fly”. On the other end of the spectrum is my E-flite Hurricane. 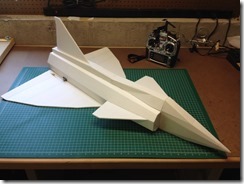 This is my “repair after every flight” plane. 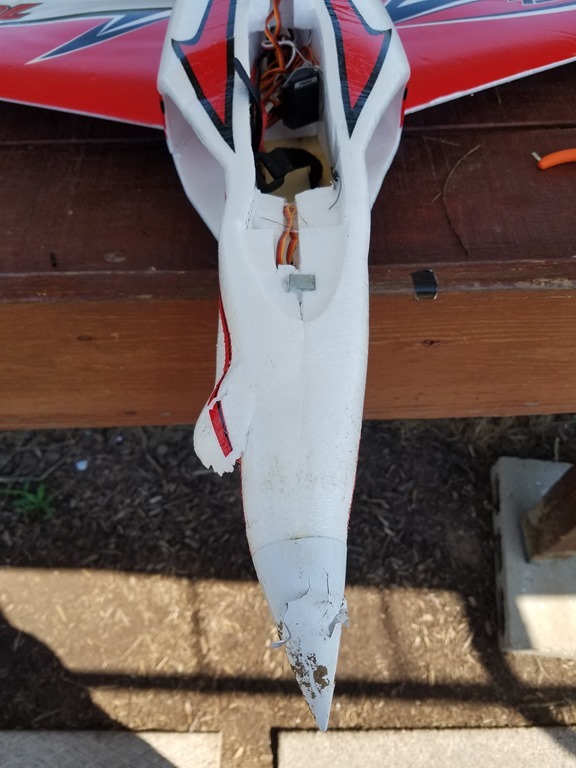 I had one fairly good flight with her today, but landed a bit hard and pulled the right landing gear mount out of the foam (again). 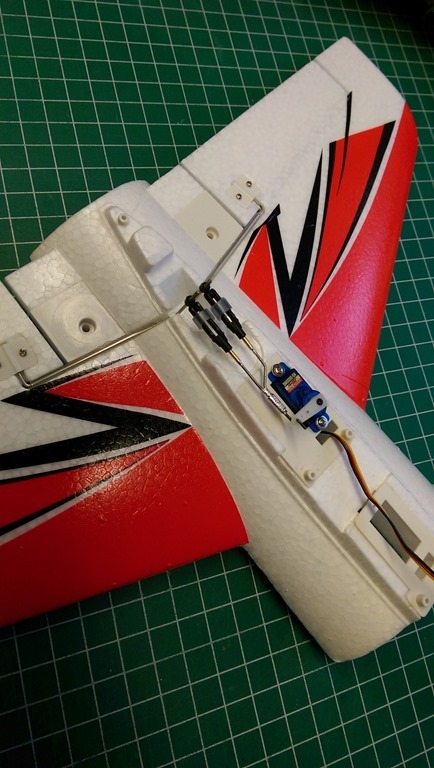 No damage to the foam and, in truth, this is working the way it is supposed to (easier to glue the mount back into the foam than it is to repair a broken wing!). Spent the morning at the field today. It was a bit crowded, and although the weather started out beautiful, the wind started gusting a bit by mid-day, so I did no get quite as much flying time in as I had hoped. 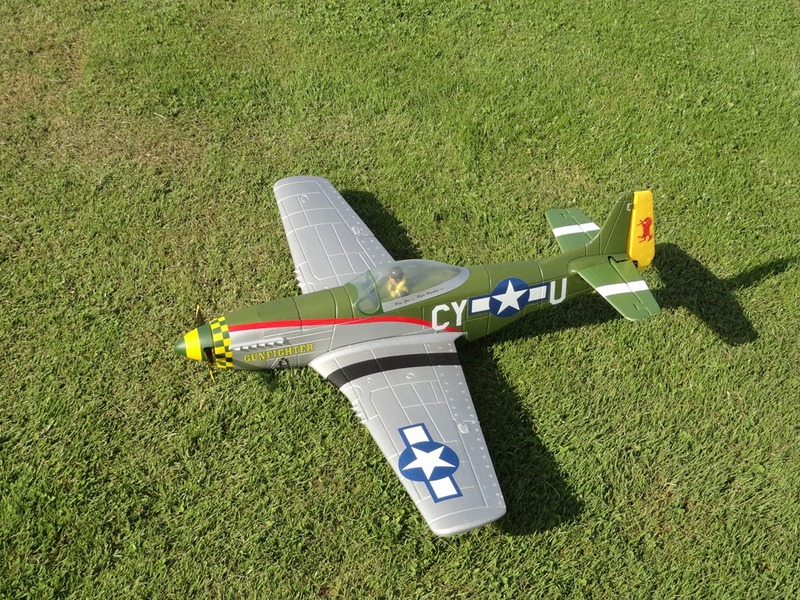 I got in a a few flights with my Park Zone P51 and F4F, but then ended up with a couple of minor mishaps. First up was a gust of wind that blew my F4F off the bench when my back was turned. It landed up side down and end up putting a small break in the rudder and elevator. Easy to fix, but ended the F4F’s flying for the day. 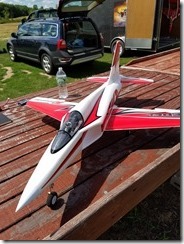 Next up was an attempted flight with my e-Flite Hurricane. This would have been my first flight for this plane this season and only my second flight ever for this particular plane. 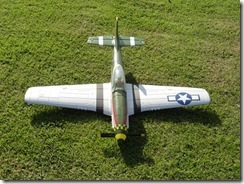 I decided to fly off the grass instead of the paved portion of the runway. I just started my take off roll and was getting up to speed, but I hit a bit of rough patch and the plane took a few strange bounces and end up nosing down and breaking the prop. 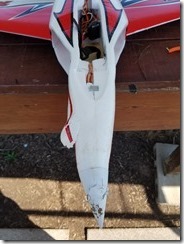 No other damage, but I did not have a spare with me, so a second plane ended up out of commission. 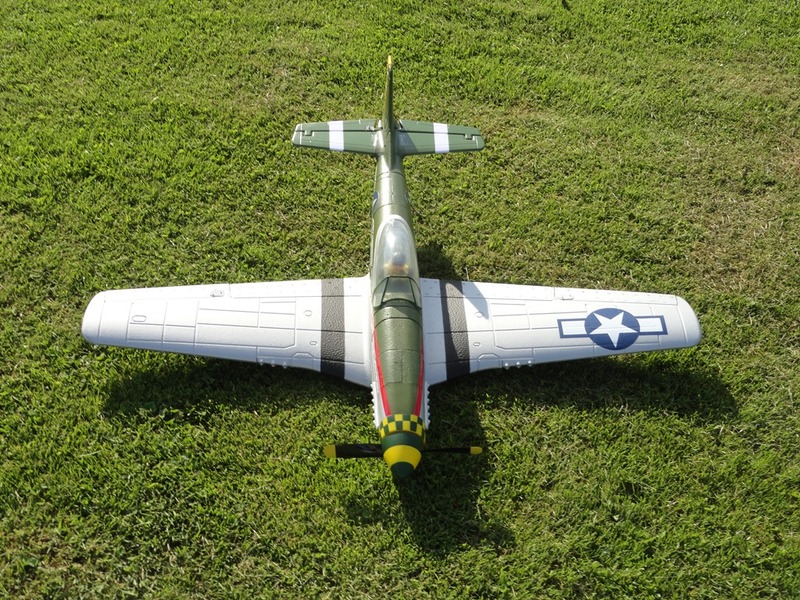 I thought about putting up my PZ P51 again, but given the wind gusts and the way my luck was running I decided that it would be better off calling it quits for the day. Still better than a day at the office though! A beautiful day at the field today! Sunny with an occasional light breeze to cool things off. There was lots of activity at the field including a giant tow plane pulling aloft some absolutely gorgeous sailplanes. This was the first time I have seen that in action and it was quite impressive. I got in a bunch of flights on my P-51. By the 4th or 5th flight, I finally started to get my head on right and feel a bit settled in. For me, I know I am at that point when I am thinking more about what I want the plane to do than what my thumbs are doing! 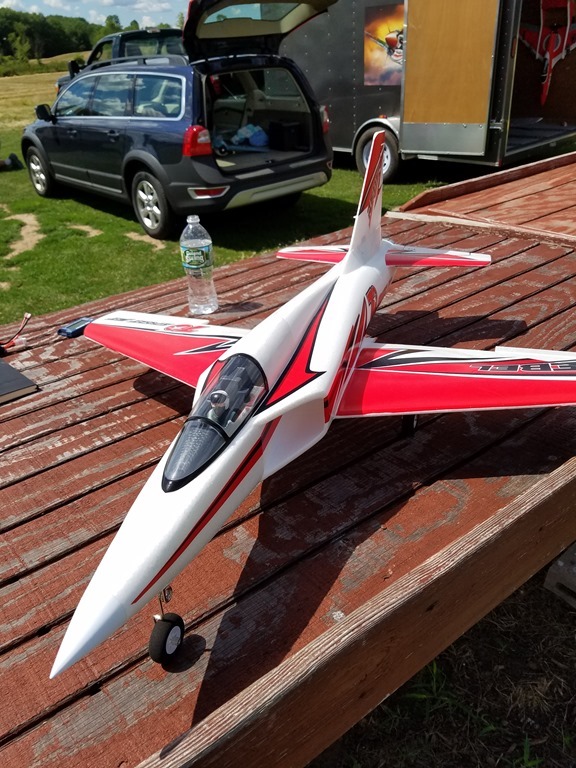 It was a perfect flying day today, so I went out for my first flights of the season. I brought my trusty ParkZone T-28 and bored a bunch of holes in the sky. My first flight of the day was definitely a bit shaky, but I settled in quickly. 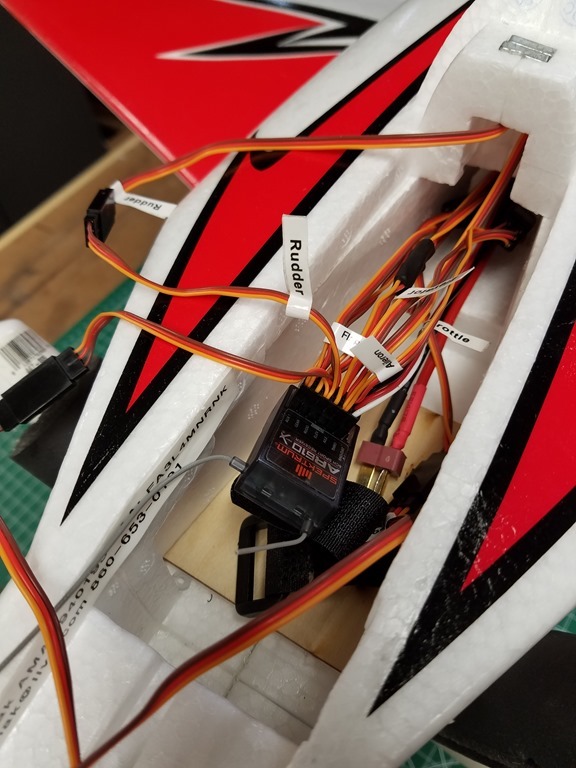 I certainly don’t consider myself to be an accomplished pilot, but by my last flight of the day, I started getting a little more daring with loops and rolls. I need more practice on the simulator so I can learn how to tie maneuvers together. Great Day For Flying Today! Been away on vacation in Canada for the past week, so not much progress on my SSE build. Still off for the rest of the week, so I did get to spend the day at the field today. What a beautiful day for flying! I got in a bunch of flights with Stella and I am liking her more and more! Rain is predicted for the rest of the week, so I’ll be back working on the SSE.